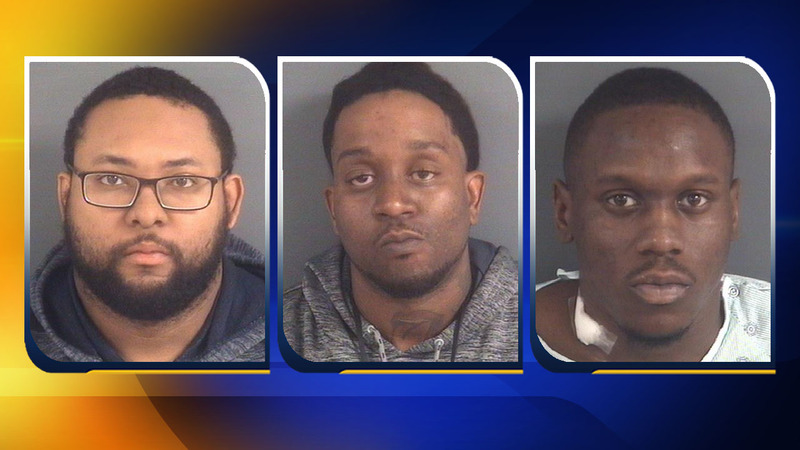 FAYETTEVILLE, NC (WTVD) -- Fayetteville police have made three arrests in a hotel parking lot shooting. Police said Thursday night that Christopher S. Grubbs, 29, of the 900 block of Country Club Drive, has been charged with attempted robbery with a dangerous weapon and conspiracy to commit robbery. Grubbs was transported to the Cumberland County Detention Center, where he is being held on a $150,000 secured bond. Detectives said that Malike Akeem Newsam, 24, of Fayetteville and Antwan Kavan Lawrence, 29, of Hope Mills were shot at the Extended Stay America Hotel around 12 a.m Thursday. Police said Newsam, of the 3600 block of Raeford Road, has been charged with attempted robbery with a dangerous weapon and conspiracy to commit robbery. Newsam sustained a gunshot wound to his buttock and hand during the incident. He was treated at Cape Fear Valley Medical Center and once released he was taken to the Cumberland County Detention Center, where he is being held on a $200,000 secured bond. Fayetteville police are investigating after two people were shot in a hotel parking lot Thursday morning. Lawrence, 29, of the 500 block of Trust Drive, is also a suspect in this case. He is currently listed in serious condition at UNC Medical Center in Chapel Hill from gunshot wound(s) sustained during this incident. Anyone with information is asked to contact Detective Donnie Smith with the Fayetteville Police Department at (910) 818-2169 or Crimestoppers at (910) 483-TIPS (8477).